I have supported Don over the years and have defended him, some of the time when his actions might have seemed indefensible. That has now changed due solely to a flippant comment Don made to the Reflector in an article, Benton’s role in D.C. changes. I have called out many, both Democrat and Republican for relying on relative’s Military Service to bolster their public image. That is their relative’s service, their valor, their sacrifices, not yours. What they did is not yours to claim. What you did is what matters. Don is too young to have been caught up in the draft when it was active, but he will never know the sinking feeling you get when starting off life as a young man to receive the letter “ordering” you to report for “immediate induction” into the Armed Services. Especially when the country is deeply embroiled in an unpopular war with riots and demonstrations going on against it. Since he never felt it necessary to enlist, he will never know what Basic Training is like. He will never know what being rocked out of your bunk in the wee hours of morning to the sound of incoming mortar rounds or a sapper attack is like. He will never know what standing armed guard and hearing unknown noises behind you is like. He has no idea of what forming a close friendship with a buddy, only to see him cut down is like. He has no clue what coming home to a country you love only to be spat upon or otherwise castigated for serving in the Army is like. He has no understanding what jumping at sudden, loud noises or being wary of strangers coming too close to you for the rest of your life is like. No Don, you have not earned the right to make such a claim of understanding what our sacrifices were. It is knowledge that cannot be learned from accounts made by your relatives, reading books or watching movies. It can only be gained by first-hand experience. So no Don, you are dead wrong. There are hundreds of thousands of us, millions of us that did don the uniform. That did serve and fully realize what our commitment and sacrifice is and was. You are not with us and whether you support us or not, are not entitled to make such a claim. Wher3e is clark county dang how did I get you? Thank you Lew. Nothing to add at all. You’ve said it well. Clark County is in Southwest Washington State. I don’t know how you got here, I do not sign anybody up to follow the blog. I will not be offended if you choose to not follow me, though. I can only appreciate your point of view as I never served either and have zero first hand experience at what it is like. I was married to a man who served in Viet Nam and absolutely displayed all those symptoms and more which you described. I could learn to understand but never to have them first hand in my natural/unnatural reaction core. Thanks again my friend for your service. But I’ll also say, in the years I have known you, not once have you ever made any claim of understanding the commitment and sacrifice more than most as Don did based on other people’s service. I’m very disappointed in Don Benton for making such a ludicrous statement as that. I have never served so can only see from the outside. My best friend served in Vietnam, but for all his stories I cannot really comprehend what it was like over there. Like Don, I can only imagine. Perhaps Benton has succumbed to the D.C. virus already – spouting nonsensical things because it’s politically expedient to do so. CCT: You’re the first Selective Service Director who’s not a veteran. Benton: That’s fake news reported by several pieces of media. That I didn’t serve in the military is inaccurate. As you know, my family has a strong military history and tradition. My father was a naval officer who helped prepare the Allied fleet for the largest invasion in history. My two brothers, one was in the Navy and one was in the Army. One was shot down in Viet Nam and on the ground for a number of hours before a Marine chopper came in and picked him up. The other one was awarded a Bronze Star with a V for valor with the 101st Airborne Division. I enlisted in the U.S Army right out of high school and received an honorable discharge. But I’ve chosen not to publicize my service in my political career. I’ve chosen not to wave that as a reason to vote for me. I felt my brothers and father happened to serve in combat and were much more deserving of that attention. I ran on the basis of my business experience, not my military experience. And nobody ever asked me about my military service. They just didn’t see it in my dossier and went with that. CCT: How long were you in? 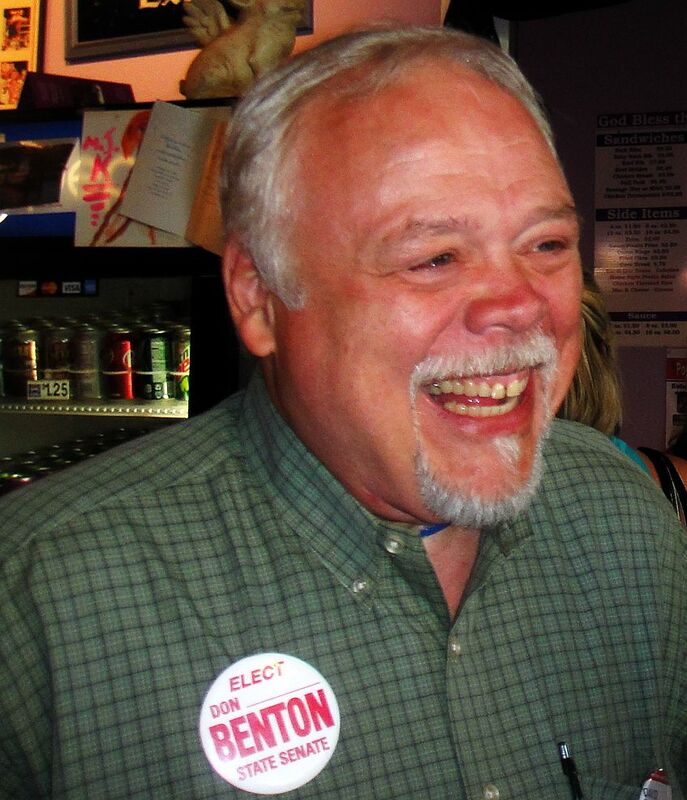 Benton: I joined right after graduating from high school in 1975. I went in under the Guaranteed (Training) Enlistment Program (which guarantees training and initial assignment in a specific job skill). I finished basic training at Fort Ord (in California), but the school I had signed up for wouldn’t be available for six weeks. They wanted me to change my MOS, and change my guaranteed enlistment contract. They had oversold the program, is what happened. And I told them, “If you can’t give me the school I wanted, I’m going to go back to college and get the training there.” And they gave me an honorable discharge. I am a committed liberal who enjoys reading your blog to get opposing viewpoints. I find a lot of your commentaries thoughtful and lacking in malice – something missing in today’s society from the right and left. Thanks to you and all veterans for your service. My issue with Mr. Benton is not that he did not serve, but on his character. His temperament, lack of integrity, inability to get along with colleagues, and general incompetence should disqualify him from any federal job. Finally, is it even necessary to have a political appointee in charge of selective service? It is a tiny organization with a miniscule budget. I would think it could be merged with another organization under DOD for cost savings.